Beach season is here, and if you’re looking for new swimsuits, Free People has plenty of options. The fashion retailer’s selection includes colorful bikinis and one-pieces perfect for sunny weather. Choose from nautical striped prints, floral blooms and vivid hues for swim season. Brands such as For Love & Lemons, Minimal Animale and Beach Riot are included in the selection. 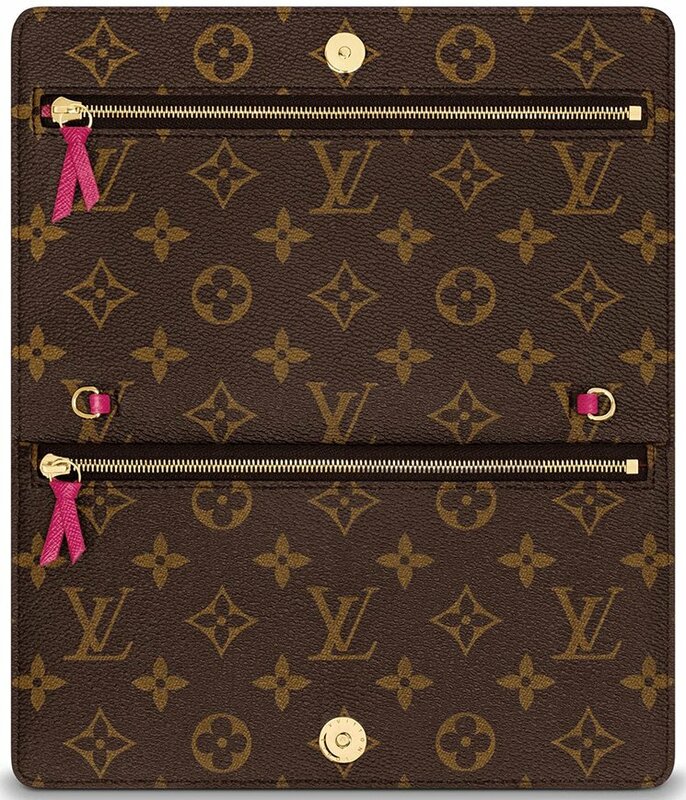 End the weekday with the Louis Vuitton Pochette Weekend Bag. Be mesmerized with the latest art – the Trompe-L’oeil. This style was introduced for the Spring Summer 2018 Collection. The Trompe-L’oeil is French for ‘deceive the eye’. It’s a form of art technique that changes realistic images to optical 3D illusion. So can you tell that the trunk detailing is fake or real? 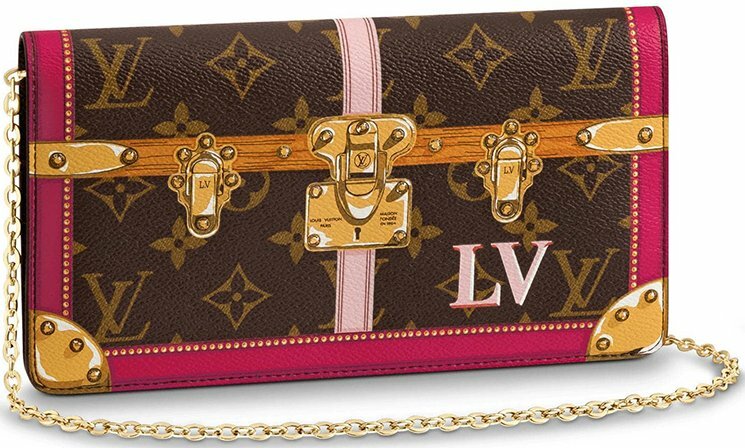 The Trompe-L’oeil detailing evokes the iconic trunk – the gold hardware and the iconic S-lock are all 3D illusions. But there is one more thing that deceives the eyes, and that’s the shape. The depth of the bag can’t be seen on the front, but only on the side. It’s a flat pouch with chain. The Pochette Weekend Bag is crafted in Damier or Monogram Canvas. It’s stylish and versatile as it can be transformed from a clutch to a shoulder bag. The chain of course, is removable. Even tough the bag is small, it’s great for the moments when you want to carry as minimum as possible. The most interesting part is obvious the interior, but the exterior will get people’s attention because they will wonder whether the hardware are real or not. 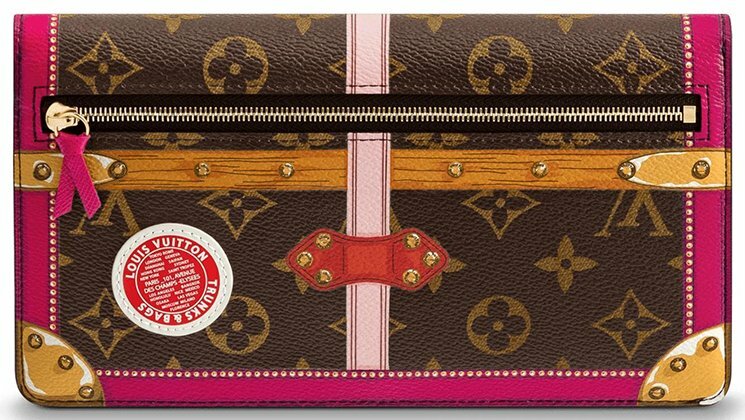 The bag features 1 flat pocket, 3 zipped pocket and 6 credit card slots. The interior is made with cowhide-leather lining. It opens and closes with magnetic closure. 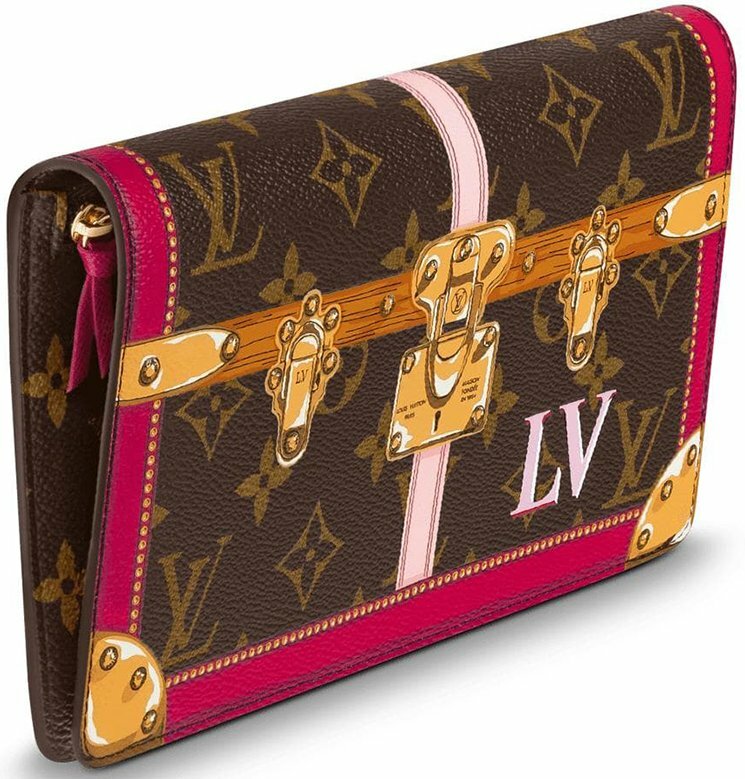 Measuring 8.7’ x 5’ inches (L x H), priced at $1080 USD, $1230 CAD, €730 EUR, £680 GBP, $8850 HKD, $1340 AUD via Louis Vuitton boutiques. Elle Fanning is all smiles on the May 22nd, 2018, cover of Vanity Fair Italy. Captured by Douglas Kirkland, the actress wears a Valentino dress with Tiffany & Co. jewelry. Inside the fashion glossy, Elle poses in enchanting dresses and gowns from the summer collections. Stylist Sarah Grittini selects the dreamy designs of Blumarine, Valentino, Gucci and more for the spread. Show off your form in this body conscious dress made in a mandarin orange hue. Likely has created dresses perfect for every occasion, and its summer 2018 collection is no exception. From body conscious silhouettes to ruffled accents, the brand offers plenty of options. A color palette of yellow, red, emerald-green, white and navy works for the warm weather months. 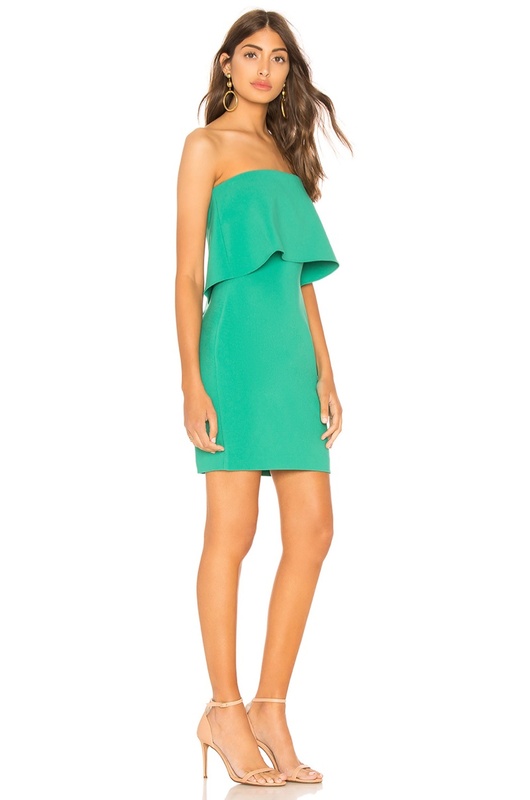 See some of our favorite Likely dresses below, and discover more at REVOLVE.com. Stand out from the crowd in a red minidress made with short sleeves. Look red-hot in a strapless dress featuring an elasticized neckline. 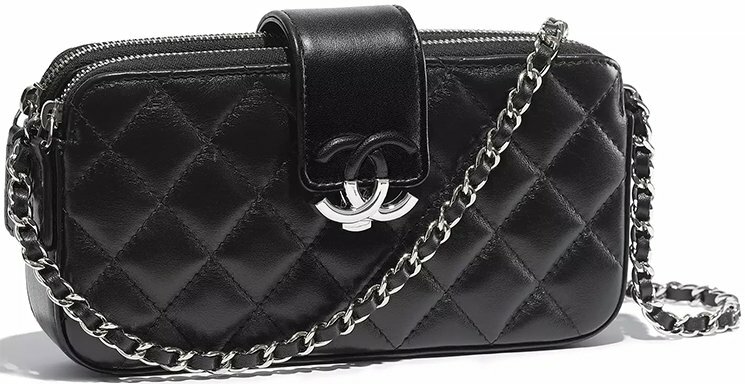 Most people still prefer the Wallet On Chain Bag, but the Clutch With Chain is getting better everyday. And it’s also less expensive comparing to the WOC yet the style looks evenly glamorous. For the Spring Summer 2018 Collection, the CC Box style has been integrated into the Chanel Clutch With Chain. And the results? A gorgeous fashion piece. 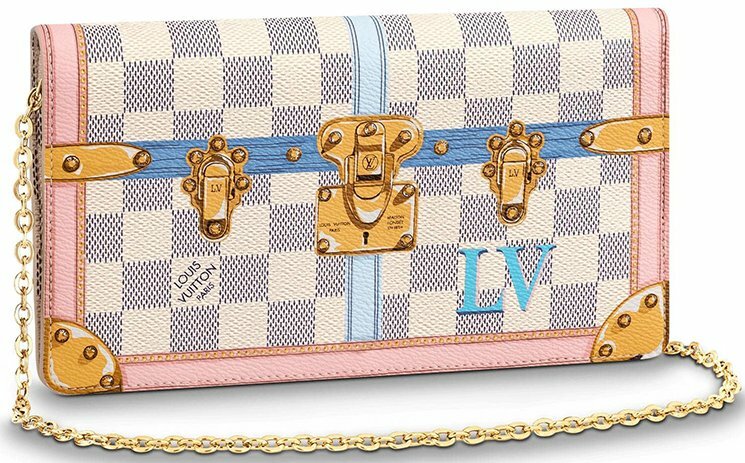 The CC Box is a new line, but it’s slowly joining the rank of the ‘upcoming classics’ like the Trendy CC Bag or the CC Filigree Bag. 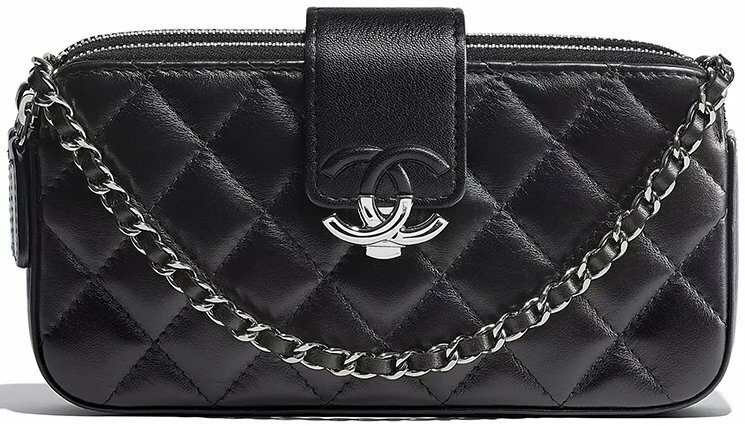 However, the Chanel CC Box Clutch With Chain is a seasonal bag and it might not be available anymore when this season ends. So take a good look at the CC Box Chain Clutch. It’s actually a very cute handbag, perfect for the evenings or carry it as a mini shoulder bag at day. The front features the new modern CC logo in part hardware and part leather. The rectangle shape reminds me of the New Mini Bag, but with a complete different feel. It comes with woven chain leather strap for shoulder or cross body carry. The front is also supported with a leather strap that connects with the medium-sized CC logo. 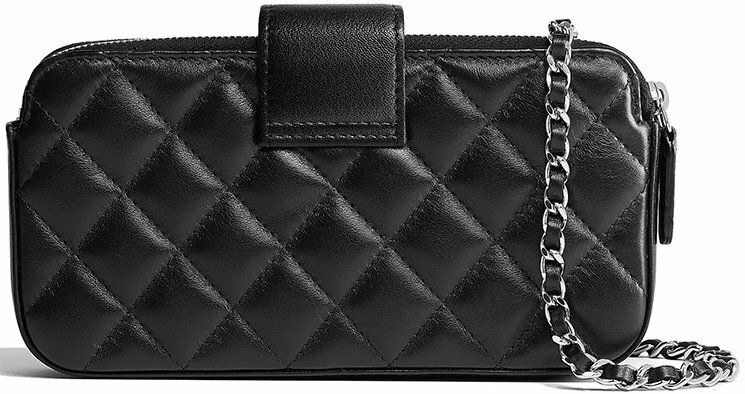 And for this season, this Chain Clutch is made from lambskin, which is a butter soft leather. The top comes with two zippers and three compartments. There is a central compartment as well as two side pockets. It has less organized pockets like the WOC, but there is space enough for all your daily essentials. Style code A84427, measuring 3.9’ x 7.5’ x 1.6’ inches, priced at $1650 USD, $2175 CAD, €1550 EUR, £1400 GBP, $2600 SGD, $13600 HKD, $2440 AUD, ¥213,840 JPY, 8120 MYR via Chanel boutiques. 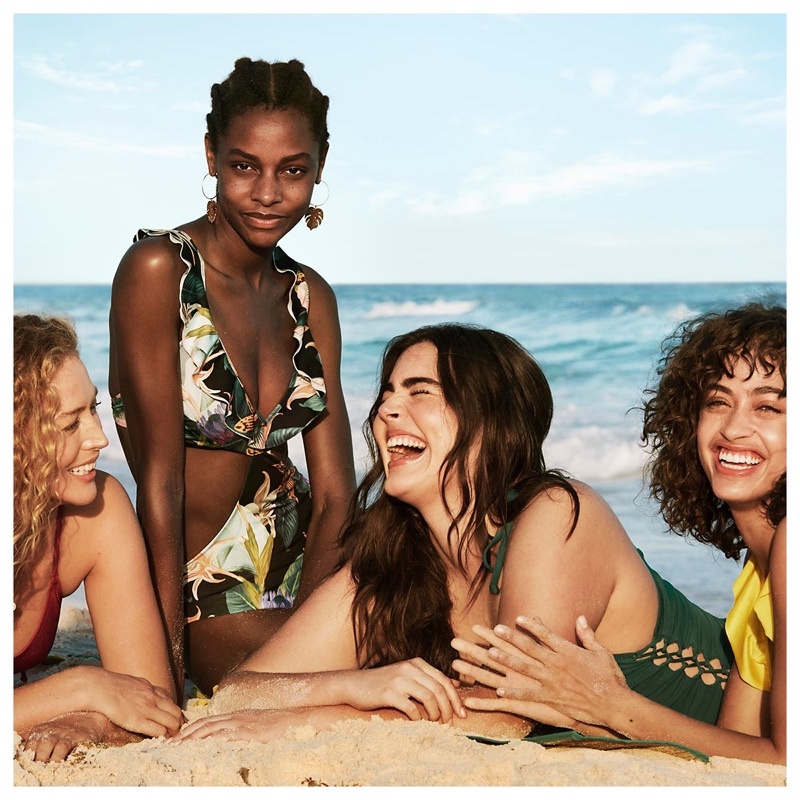 H&M heads to the beach for its Summer 2018 campaign. The Swedish fashion brand enlists a group of leading models for the advertisements captured by Cass Bird. 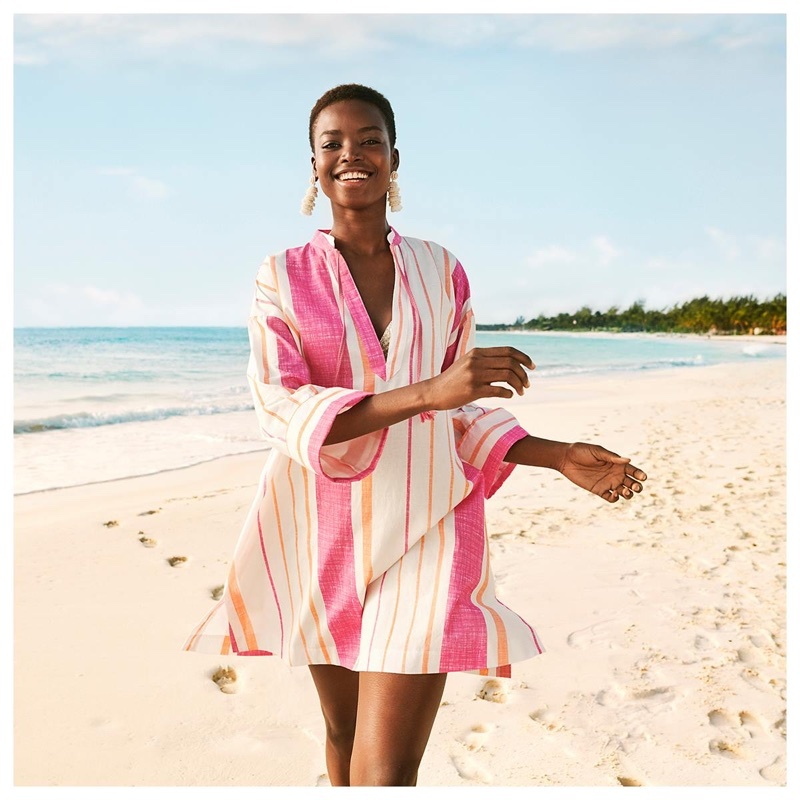 Carolyn Murphy, Maria Borges, Alanna Arrington, Pooja Mor, Karly Loyce, Raquel Zimmermann and Chiharu Okunugi appear in the sun-soaked shots. 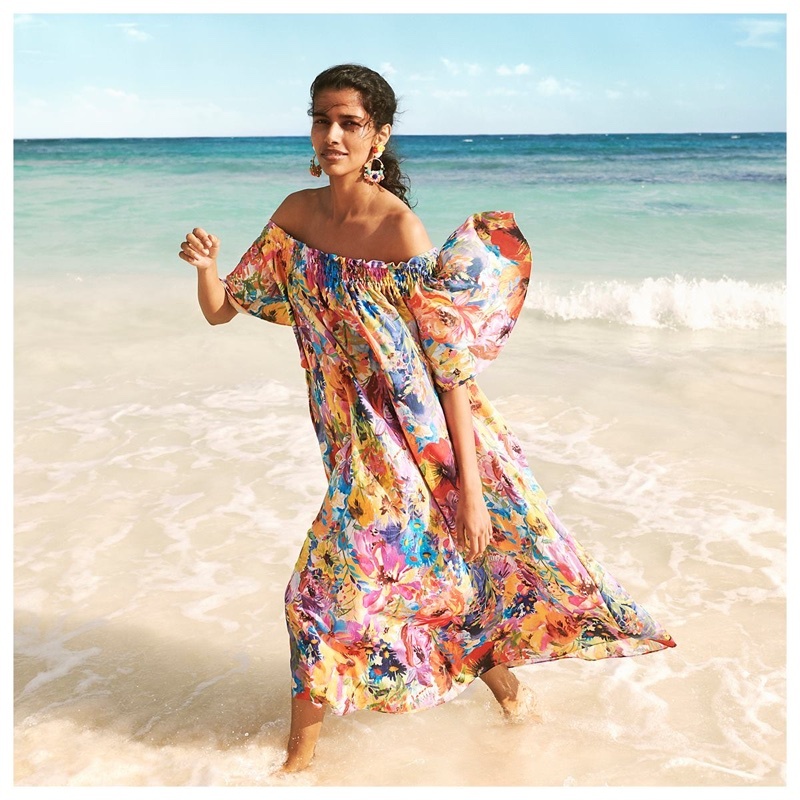 Styled by Lisa Lindqwister, the images spotlight colorful swimsuits, breezy dresses and tropical prints. James Pecis works on hair for the shoot with makeup by Frank B.